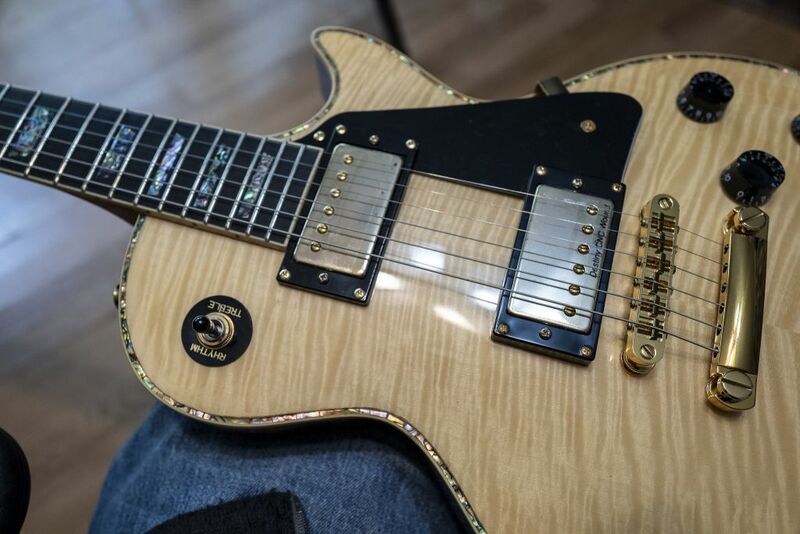 New to me is this les paul clone - by Wolf Guitars from South Korea. This is a fantastic guitar, and a phenomenal bargain at 449$, with a gig bag and free shipping in the US. I got it from https://www.allinoneguitars.com (I'm not affiliated). If you might be interested in a les paul but don't want to pay the $$$ for a real one, this might be a viable alternative. 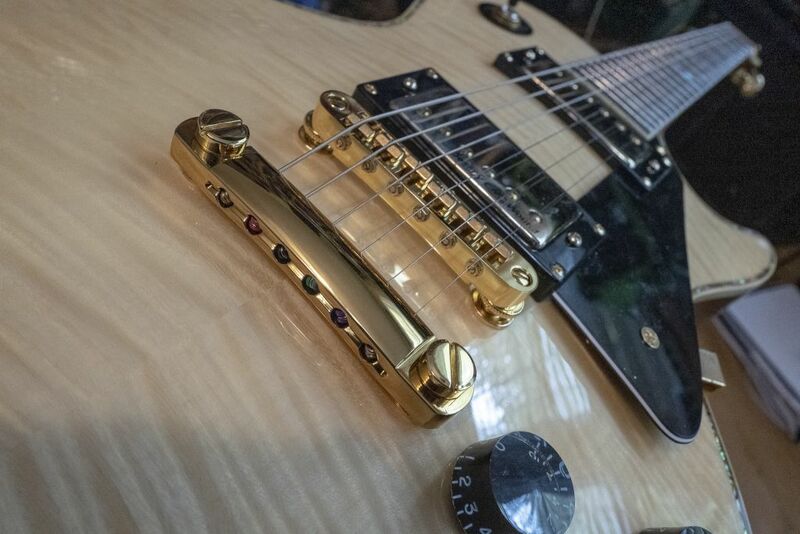 It's made from the standard les paul type ingredients - mahogany back and neck, maple top (the flame part is a veneer, but there's an actual full layer of regular maple under that), ebony fingerboard, normal electronics. And a bunch of cool looking abalone around the sides and top, and in the neck inlays. The ebony fingerboard is a real bonus - love the feel of it. And the neck is great - it's a thin, 60's style one, slightly narrower than the real thing, but plays great, and came perfectly set up - they take pride in sending them out pre-set up, and quiz you about your preferences when you buy them. The electronics are passable, unlike most of the chinese clones - the pickups actually sound pretty decent, although the pots are the cheapo korean kind that are guaranteed to lock up in a few years. 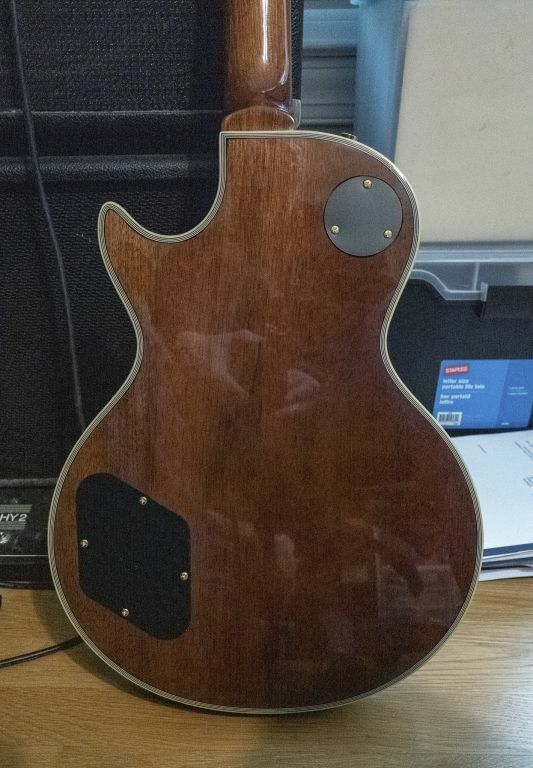 I will most likely be updating the pickups and knobs fairly soon. My history with les pauls - back when I was starting out on guitar, they were the top of the line, the best thing available, what my idols were using. I always wanted one, but couldn't ever afford one I liked. I did have a few of them over the years, and several decent clones, but my main guitars ended up being strats and strat clones. And for maybe the last 20 years I've only had strat clones. But a while back I was playing a recording session for my brother, and he handed me a les paul, and I found that I was able to get around on the neck a bit better than I could on the strats. 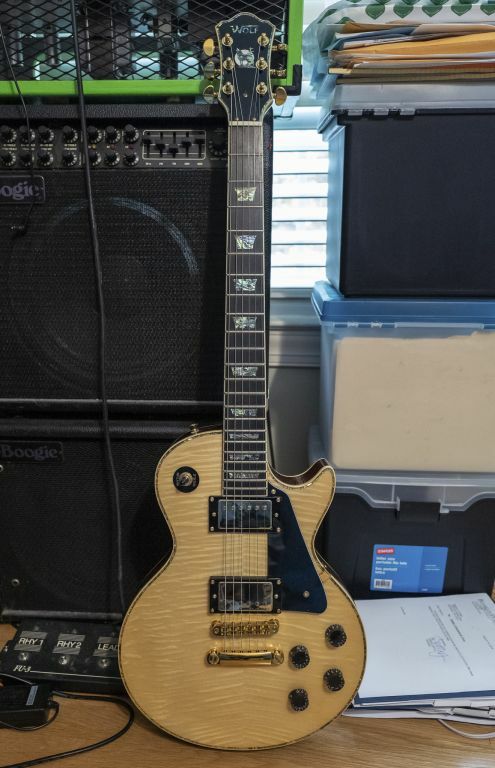 So about a year ago I bought a chinese les paul clone. Which was kind of fun, and it looked great, but the neck was pretty terrible. So I started trying the real things in stores, and must have tried 20 or more of them, and finally bought one. It's green. Inverness Green is the official name of the color, although I think it looks like mental ward green. So I can compare this new one to really nice real thing, and while there are some obvious differences, the overall playing experience is very similar - same shape, balance and weight (heavy - don't ask). Nice! Thanks for the heads up! I am more of an SG guy but this looks slick! Just changed out the electronics, updated the pickups to Seymour Duncan JB and Jazz, put on Ratio locking tuners and a string butler, and this thing is a sustain monster that stays in tune! You can hammer on it all you want, for hours, and it'll still be in tune. I picked one of these up partially on the recommendation of Sduck. It is a really fun guitar - I'm enjoying the weight and playability. The communication from allinoneguitars was a little funky at times (they didn't have the case to ship the guitar and didn't communicate for a while). But overall good experience and enjoyable guitar. Thanks for the heads up. Cool! What model? Color? I would love to see pics. I went black and gold. It looks like a Narcos gun. I'll take some pics this weekend and share them. Again, thanks for the heads up. It is a really fun guitar to play without feeling like I have to baby it because it was really expensive.